Jack White's label, Third Man Records is going to attempt to play the first phonographic recording in space and they'll be streaming the whole thing live. The attempt will take place in honor of the label's 7th anniversary and the record will be a gold-plated 12" master ofastrophysicist, Carl Sagan's 'A Glorious Dawn'. It also marks the label's 3 millionth record pressed. For those of you a bit closer to the home of Third Man Records can also get tickets to attend the 'launch' party which will be held at both Cass Corridor and Nashville locations. Both parties will feature live bands, exclusive, commemorative merchandise, and limited edition, 12" gold vinyl copies of the 3 millionth pressing, 'A Glorious Dawn' will be available for purchase, as well as a few other limited, exclusive LP offerings. 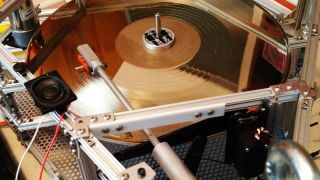 The record will be launched and played in the Icarus Craft, which has been developed by Kevin Carrico with the help of the SATINS program. Lineups for both parties be announced this week and the events themselves will begin at 11am EST/10am CST with a takeoff time of exactly 12pm EST/11am CST. More information on the live streaming event will be announced on the Third Man Records website in due course.